Will we ever have the luxury of owning a robot maid like Rosie on The Jetsons? Until then, science has come up with some pretty ingenious tools to complete your household cleaning with less time and effort. Here are some of our favorite products to keep your Springs luxury apartment home passing the white-glove test. In the dozen or so years that Magic Erasers have been on the market, they have become a staple in many households. These small wonders can handle any mess from baked-on grease to scuff marks on the wall. Here's a secret: DIY magic erasers are easy to make and cost about 10 cents each. Scrub Daddy is the most successful product to come out of Shark Tank. This deceptively simple sponge reacts to water temperature and changes texture to accommodate whatever cleaning strength you need. Even the cheerful smiley face is designed for practical purposes. 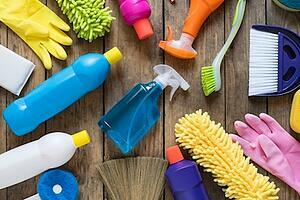 Has eco-awareness made you more conscious of the perils of chemical-laden cleaning products? Microfiber cloths can dust, clean and polish just about any surface in your home using nothing more than water. The dense fibers attach themselves to dirt, and the cloths are washable for multiple uses. Get rid of all those grungy toothbrushes underneath the sink and pick up one of these clever brush sets. They come in two sizes for cleaning those awkward places like grout, shower door tracks and fixtures. The small brush has a wiper blade tip that's perfect for crevices, like the ones around sink drains. The granite countertops in our Springs apartment homes look luxurious, but they don't require any elaborate cleaning methods. Just wipe them down using a cloth sprayed with Better Life Granite and Stone Cleaner. This product is non-toxic and biodegradable, so it's safe to use around kids and pets and it won't pollute the waterways. Stop ignoring the dust in higher-up areas. This amazing duster extends to 54" and rotates 270° for easy cleaning of hard-to-reach spots like the tops of the ceiling fans in our Springs apartment homes. Does it sometimes feel like you need to be an acrobat to get the bathtub and shower clean? Clorox Scrubtastic is a rechargeable cleaner with a circular brush head that spins at more than 300 RPM to blast dirt and soap scum away. The handle extends to 39 inches to reach up and down. Want something a little more economical? Clorox's Bright Blue Tub and Tile Scrubber is essentially the same product without the battery. Do you have a cleaning tool to add to the list? Let us know in the comments!